Cheering on a Marine Corps Marathon runner? Check out the best places to watch, some tips about rooting on a runner and a list of things you can't bring. WASHINGTON — Thousands of runners will flood D.C.-area streets later this month during the Marine Corps Marathon — and with them comes even more spectators. 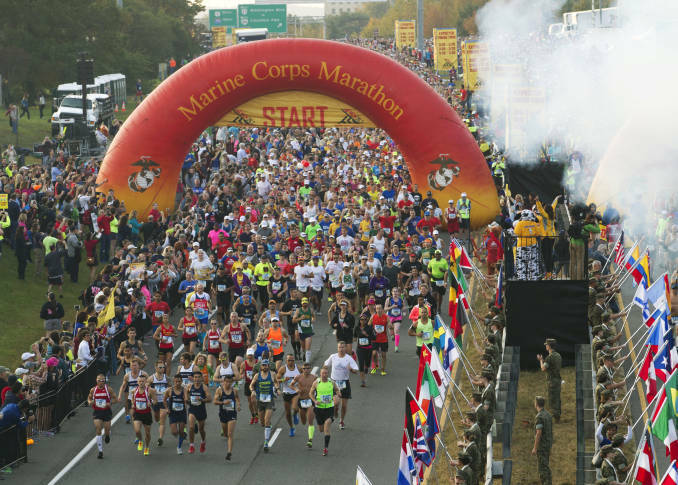 This year, more than 100,000 spectators are expected to come out to support the more than 30,000 runners competing in the Marine Corps Marathon and MCM10K on Oct. 28, said Marc Goldman, marketing and sponsorship manager for the Marine Corps Marathon. There are about four spectators for every one runner, plus the local population that comes out to watch the event, he said. Heading out to cheer on a runner? Don’t forget a way to stand out, Goldman said. “You either want to be wearing something identifiable or a sign that is clearly distinguishable. Some people get giant cutouts of the runner’s face that they hold up. Some people bring balloons so runners can see their support crew,” he said. Also, spectators want to have the MCM app downloaded on their phone so they can track the runner and receive live updates as runners hit different splits along the course. Spectators should leave glass bottles, face masks, drones and big bags at home. There are screening points around the start and finish areas, and spectators will have their bags checked — it’s all part of keeping the race safe, Goldman said. “It is intended to keep the experience safe for all those participating in the event — whether they are running or supporting on event day,” he said. “We reinforce ‘if you see something, say something’ and hope that they are out there to keep the event as safe as possible,” Goldman said. The Marine Corps Marathon is a good course for spectators, Goldman said. Spectating for the Marine Corps Marathon can sometimes be as exhausting as the 26.2-mile race — bouncing around town and dodging road closures. Spectators can see their runner in as many as five locations on the course. Here are the stops Goldman suggests for spectators who want to cheer on marathoners. 1) Watch the opening ceremonies at the MCM Start Line on Route 110 in Arlington, Virginia. Access this location by Metro using Rosslyn or Pentagon stations. In photo, runners start the 41st Marine Corps Marathon, Sunday, Oct. 30, 2016, in Arlington, Virginia. New this year, the Observation Deck at CEB Tower in Rosslyn will open to spectators who want to view the race from 31 stories above the city. The VIP experience includes food and drinks and costs $75 per person; tickets are limited. Runners and visitors who want to visit the towers can get discounted admission Thursday – Monday, and after 1 p.m. Sunday. Near the finish area, runners and spectators can reunite in the “family link up” area. There are several large 13-foot towers with letters of the alphabet where both parties can plan to meet up after the race. 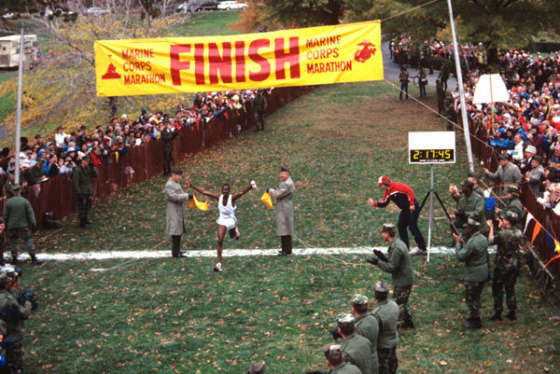 Get more spectator tips on the Marine Corps Marathon website.